A 92-year-old retired shopkeeper who collected motorbikes for almost three decades is selling his entire collection. George Geeson from South Witham in Lincolnshire began collecting the machines 37 years ago, but he now finds it is too much work to maintain them. "It is getting a bit much now, but I still love the old bikes. "It will be heart wrenching to see the old bikes go, as it means a gap of 37 years in my life," he added. Mr Geeson and his brother operated a garage on the A1 near their home for almost 33 years. 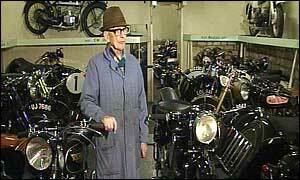 He repaired and sold motorbikes and cars, including the famous Model-T Ford. The 80 restored bikes at his small museum - including a Sunbeam 90 and several Douglas bikes - are from the 1920s and 30s. They will be auctioned at Peterborough Showground on 29 March. "You have to be really interested - if you are 100% interested, that is not enough, you have to be 200% interested," George said. "It has been a fantastic hobby to do something you like for so many years. When we were teenagers, we had such fun out of motorbikes that we decided to go back to our teenage years and continue enjoying them."